It may have seemed like a forgone conclusion (NHL deputy comissioner Bill Daly said today, "I think it's fair to say there was no realistic expectation to avoid a lockout as of developments on Wednesday and Thursday") but the owner's self-imposed deadline was midnight tonight. Nothing happened or will happen today, according to reports from the non-negotiations, so here it is: a lockout, for sure. This was the third straight day the sides spoke by phone but avoided the negotiating table. "Today we suggested that the parties meet in advance of the owners' self-imposed deadline of midnight tonight," [Players' association special counsel] Steve Fehr said Saturday in an emailed statement to the AP. 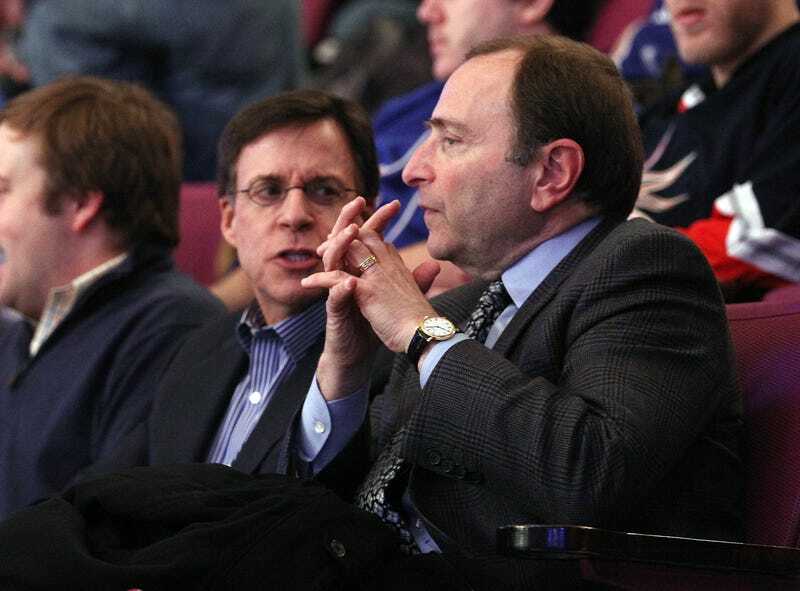 "Don Fehr, myself and several players on the Negotiating Committee were in the city and prepared to meet. The NHL said that it saw no purpose in having a formal meeting. Players absorbed a salary-cap system and took an immediate 24 percent rollback of existing contracts in 2005 in exchange for 57 percent of hockey-related revenues. The NHL now says that figure is too high, and is willing to have another league shutdown to reduce that share to 49 percent to 47 percent. Training camps were set to begin next week; they won't. The season was scheduled to start on Oct. 11, but that too seems unlikely. Condolences to all hockey fans; this looks at the outset like it will be a long and ugly fight between the NHL and its players, with fans caught in the middle. We have a feeling we know who you'll side with.